A fresh gemstone and an updated setting work together to make this a halo ring with a decided lively personality. This Pave Diamond Criss-Cross Peridot Halo Ring provides a cool, contemporary take on a style that originated in the 1920s, one that's sure to turn heads with its unique silhouette and add a bright splash of color to your look. In place of the traditional single band is a pair of 14K white gold bands that intersect, both directly beneath the center gem and at the back of this fun and glamorous piece. These matching, criss-crossing bands are studded with dozens of small round diamonds that allow this piece to reflect light in many directions. While the eye-catching "X" shape of this ring certainly makes it stand out, that's far from the only aspect of this that draws attention. 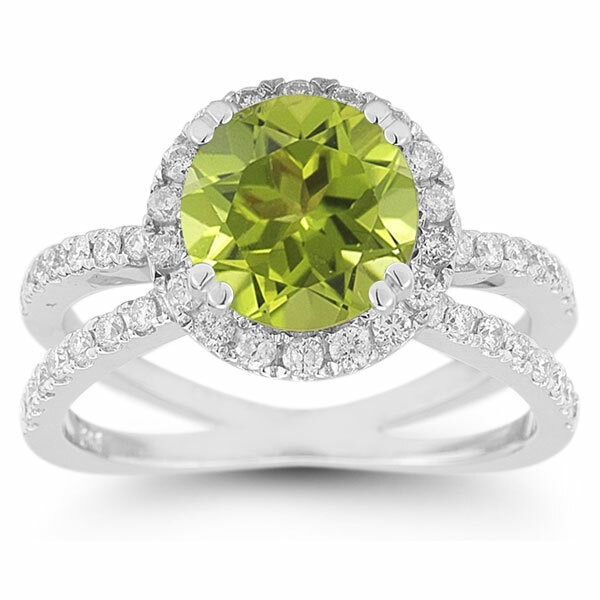 The 8mmm round peridot that glitters as this ring's focal point has a refreshing green hue that seems to capture the spirit of summer. With a hint of golden glimmer, this gemstone is bright and bold, and it's perfectly contrasted by the small round diamonds that surround it with a frame of colorless glimmer. With 57 diamonds (nearly three quarter carats) in all, this ring sparkles with life and sophistication. 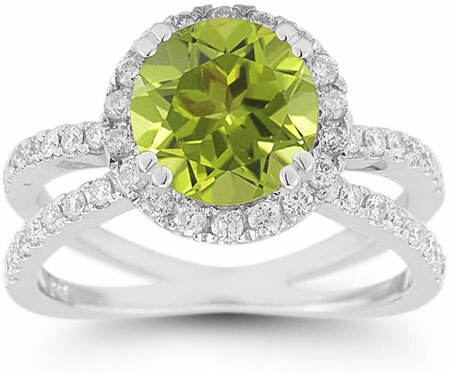 We guarantee our Pave Diamond Criss-Cross Peridot Halo Ring to be high quality, authentic jewelry, as described above.